The defeat of the ISIS self-declared Caliphate in Iraq and the Levant has caused many strategic pundits to refocus on the “ungoverned” areas of Afghanistan and a resurgent Taliban. With the refocus comes much speculation on how to win the hearts and minds of the “Afghans.” One hopes this time around is the last, and perhaps the U.S. will realize that “winning the hearts and minds” may not be necessary to earn cooperation to achieve a mutually beneficial future between the West and Afghanistan. What are the interests of the United States and NATO in Afghanistan? Let’s hypothesize that it’s to reduce “ungoverned” spaces to prevent terrorist organizations from operating in those spaces, then threatening attacks in the West. What are the interests of the rural population (the sea the Taliban swims in)? Let’s hypothesize that this population wants to provide the basic necessities to their family and clan in a safe self-governed environment. Sounds congruent, but reality is more difficult. "A Message From the People"
A Tale. 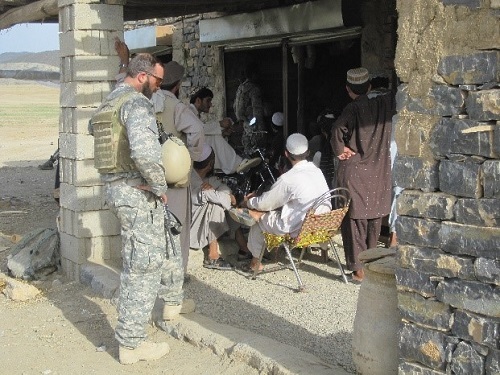 One of my first experiences as an IO advisor in Afghanistan included an embed with a unit training provincial police in Pashtun populated eastern Afghanistan. Understanding the Pashtun culture is a lifelong endeavor, but the event shown in the picture above captures it in a nutshell. The area shown looks like a harsh desert but in reality it is less than a quarter mile away from an extensive plot of tiered lush green fields. A U.S. outpost was also nearby. The location of the outpost was along the escape route used by many of the Al-Qaeda and Taliban leaders early in the war, plotting a security post there limited the use of that route while forward positioning forces to disrupt adversary movements. The truck in the picture is a human waste vehicle from the outpost. The truck had been spreading the human waste on a barren field that had an underground water source to nourish those fields. According to the district police chief the local elders asked the camp leaders to stop using that area as a flush point, but the act did not stop. When it didn’t stop, a small IED was placed on the path of the spreader. A tire was blown off, truck partially flipped, and driver essentially unhurt. The size of the IED was not designed to kill, just send a message. We were 8 years into the Afghan conflict, and did not understand (or perhaps did) why disposing the waste in that specific area was a bad thing. The Afghans asked for it to stop, and when it did not, they defended their resource. 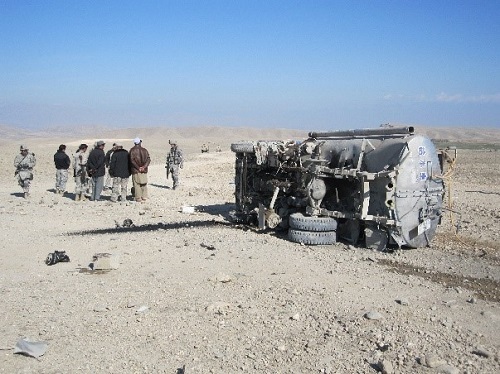 These same Afghans, prevented that outpost from being rocketed or mortared for years and until the truck incident there was little kinetic action in the area. So what? On the surface spreading that human waste in a barren field seemed logical, and the request for it to stop illogical. So it continued until the event forced us to pay attention to the interests of the local population. Let’s zoom this to a strategic view. 17 years into the Afghan Conflict and we have not defeated the Taliban to the point of surrender. Total surrender is not going to happen; but why? At the risk of over simplifying. We have the most efficient killing force ever seen on the face of this earth, yet the Taliban is again gaining strength. It might be worth remembering that the Taliban is not Al-Qaeda, or the Islamic State of Iraq and the Levant (ISIL). Yes, the Taliban hosted Al-Qaeda even after 9-11 because the leader of the Taliban, Mohammed Mullah Omar (MMO) AKA the Leader of the faithful, felt bound by Pashtun idea of protecting guests invited into your home. Don’t get me wrong, the Taliban too is a fundamentalist Wahabbi based movement that committed atrocities inside the borders of Afghanistan, but they never attacked the United States soil. Quick review, MMO and the Taliban also were part of the force that fought and defeated the USSR (with our help) protecting the Afghan people from a foreign governing structure being forced upon them. The Taliban emerged as a liberating force after Soviet withdrawal. Heroes of the Afghans. Every Afghan I ever asked in the eastern provinces had family members, or, themselves were considered Taliban. The US and NATO are determined to prevent Afghanistan from ever again becoming a free-play zone for terrorists. Rightfully so, many areas in Afghanistan and Pakistan’s Federally Administered Tribal Areas (FATA) housed and continue to house training areas for some of the world’s worst terrorist organizations. These organizations are savvy enough to know if they provide arms, funds, and motivation to the Taliban, they will continue to disrupt the efforts of the Afghan security forces creating the opportunity to train their terrorists in other parts of the nation. The Taliban is being used to some extent. We need to understand this framework if we are going to discuss how we are going to influence the Afghans to partner with us to achieve not only our objective but theirs’ as well. Below are two simple theories that might help us re-gain a partnership with the majority of Afghans. These two ideas focus on knowledge of the Afghan culture and audience; their goals, concerns, and reality. Unlike some other articles, I will not be prescriptive in terms of resources, without an agreement on the end-game the forces don’t matter. Poge Colonel, from the film “Full Metal Jacket” (1987). Common interests. The ungoverned spaces are not unpopulated. Where there are people, there are good guys and/or bad guys trying to gain support of the people. One side even takes quarter and resources from the population leveraging the nature of the Afghan hospitality and Islamic commonality. This side is often despairingly called “foreigners” or “the Arabs” by the locals. These foreigners disrupt the locals’ ability to take care of their own, preventing them from achieving their interests. Given this circumstance, you don’t even have to train the locals nor arm the population. Initially if they need help to reject the foreigners then help with the goal of the locals are able to take care of their family. Prove you share the same interest regarding the foreigners. Our gain, protecting the village protects the world from the foreigners; terrorists. to Former Speaker of the House Tip O’Neill. "The Afghan Way of Governing: An Impromptu Shura with Security Forces"
There is a traditional power structure throughout Eastern and Southern Afghanistan, and it doesn’t always look like a western society’s structure. This Shura through Loya Jirga structure has served Afghanistan for years. The Taliban used this structure to spread their regime because they were weened in that system. In that system tribes, clans (foundation of districts) govern locally, settle disputes, protect the populations and negotiate with neighbors. If outside resources were needed they were directly requested from the monarchy, or federal power structure. The province wasn’t even a consideration. Therefore, even 17 years later, there are many Afghan leaders that are associated with the Taliban, as are their brothers, cousins, and clan members. Is the Taliban our enemy, or do they share the interests of the US and NATO to reject “foreigners” that threaten the population’s ability to provide for their family. If we continue to reject the Taliban, do we reject a significant portion of the population that just might want the same thing we do, foreigners out of Afghanistan. We have to forge a treaty that includes representatives of the Taliban, alongside the sitting federal government, starting with expelling foreign terrorists like Al Qaeda, the Islamic State, and even the Tehrik e Talibi from Pakistan out of Afghanistan. The influence operation convinces the Afghans that we share their goal to get foreign military interference out, to include ourselves. Our guarantee must include providing Afghans with the ability to target and eliminate “foreigners” seeking to exploit rural Afghanistan. Conclusion. Practical strategic objectives, learned after 17 years of walking among the Afghans, should not be wasted in the political power centers in Washington DC and Brussels. The military forces we have developed over the past decade and one half, to include the 'Train, Advise, and Assist' brigades, are all results of the evolution experienced from this war and are very capable. But no force will “win” support without a common endgame among partners. Let’s start with getting the foreigners out of Afghanistan, using the Afghans; even the Taliban to help. Our common goal is the security of the family, clan, and village that will ensure terrorists will no longer freely operate in Afghanistan. I acknowledge this isn’t groundbreaking, just some reapplication of tactics, techniques, and procedures (TTPs) we used in Unconventional Warfare (UW) and Foreign Internal Defense (FID) pre-9-11. About the Author: RJ Hampsey joined the Counterinsurgency (COIN) Advise and Assist Team (CAAT) in November 2009 and was assigned to advise and assist the officers, NCOs, and Soldiers executing information operations, PSYOP, and Civil Affairs in support of Regional Command East. In total he spent 36 Months as a member of the CAAT in RC-E and HQ-ISAF; and the Military Information Support Task Force. (MISTF).